Jules (Drayton, United Kingdom) on 14 January 2012 in Landscape & Rural and Portfolio. The base of Mt Philipps in the forground with the peaks of the Sheerdown Hills in the distance, between them flows the Arthur River and the world famous Milford Track departs for Te Anau Downs. Milford Sound (Piopiotahi in Māori) is a fiord in the south west of New Zealand's South Island, within Fiordland National Park, Piopiotahi (Milford Sound) Marine Reserve, and the Te Wahipounamu World Heritage site. It has been judged as one of the world's top travel destinations and is acclaimed as New Zealand's most famous tourist destination. Rudyard Kipling had previously called it the eighth Wonder of the World. Named after Milford Haven in Wales, the hometown of Captain John Grono who discovered it around 1812. 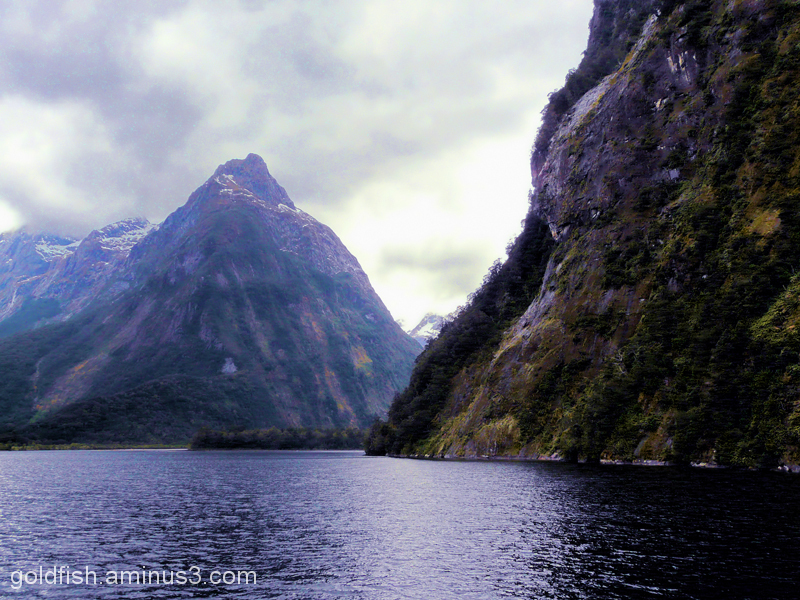 A few years later it was renamed to Milford Sound by Captain John Lort Stokes. Prior to the European arrival the fiord was a playground for the local Māori who understood the migrations of local marine life and the tidal patterns. Milford Sound runs 15 kilometres inland from the Tasman Sea at Dale Point - the mouth of the fiord - and is surrounded by sheer rock faces that rise 1,200 metres (3,900 ft) or more on either side. Among the peaks are The Elephant at 1,517 metres (4,977 ft) and The Lion, 1,302 metres (4,272 ft). Lush rain forests cling precariously to the cliffs and occasionally portions of the rain forest will lose their grip on the sheer rock face, the resulting tree avalanches leave scars of bare rock amongst the vegetation. The sound sports two permanent waterfalls (Lady Bowen & Stirling Falls), although after prolonged rainfall many more additional waterfalls can be seen cascading down the sheer rock faces. As Milford is renowned as the wettest inhabited place in New Zealand and one of the wettest in the world it is commonplace to see these temporary falls. Fantastiqeu cadrage avec les deux plant des montagne sueprbe vue et compo. @CElliottUK: There are massive similarities between parts of Scotland, Wales and even the Lake District! However the overwhelming sense of scale cannot be matched and unfortunately the photos don't really convey this. In this particular photo, Mt Philipps has a vertical cliffs to it's summit at 1446m while the front peak of Sheerdown Hills rises to a staggering 1723m - Ben Nevis huge as it is, has a summit of 1344m but is a much more rounded namby pamby sort of shape. Una imagen impresionante,todo un privilegio. I love the stark difference between the left and right sides. Majestic peaks and marvelous textures! Extraordinary capture of the light as well. I'd like to be there. Fantastic shot. stunning shot and other-worldly beauty here!! Well done!!! Before I read your description I recongnised this famous NZ landmark, I'm yet to visit it and take a photo like this. Great work. The colors are gorgeous. What a beautiful landscape! excellent capture again! love the composition!